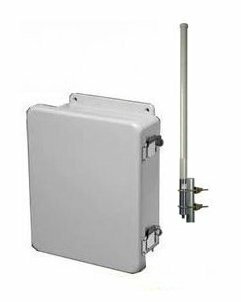 Series WCS-27A Long Distance Wireless Transmitter/Control Panel System provides a wireless bridge between any type dry-contact switch, PLC or Controller and an electro-mechanical relay. When a switch connected to the transmitting unit opens or closes signals are sent via a license free radio signal to a receiver unit up to 10 mile (Line-of-site) away. When the relay control panel receives the proper wireless signal from the transmitter a power contactor inside the panel is energized to operate a pump, valve or motor. The Pump Control Panel features power and contactor fusing, latching or non-latching control. Models are available with 1, 2, 4, 8, 12 or 16 control lines.